Army guards at the Abu Ghraib prison in Iraq kept some prisoners awake for as much as 20 hours a day at the direction of private contractors and military intelligence soldiers, a private interrogator told investigators. The statement from Steven A. Stefanowicz conflicts with accounts by some top generals, who contend prison guards were barred from such active participation in interrogations. Stefanowicz also said he may have heard, but did not see, some military police physically abusing a prisoner. Otherwise, he said, he did not see any abuses inside Abu Ghraib like those documented in photos that became public this spring. 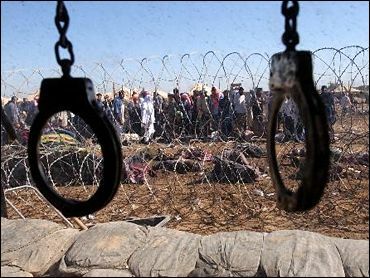 According to the Wall Street Journal, Stefanowicz's testimony indicates that interrogation methods like stress positions and dogs were used in U.S. prisons in Iraq after they were barred at Guantanamo Bay. The Pentagon has said prisoners in Iraq were covered by the Geneva Conventions, while terrorism detainees at Guantanamo were not. Separately, the American general who was in charge of Iraq's Abu Ghraib prison claimed she was being made a scapegoat for the abuse of detainees, and said her successor once told her that prisoners should be treated "like dogs." In an interview with British Broadcasting Corp. radio broadcast Tuesday, Brig. Gen. Janis Karpinski said Maj. Gen. Geoffrey Miller told her last autumn that prisoners "are like dogs, and if you allow them to believe at any point that they are more than a dog then you've lost control of them." Miller was in charge of the Guantanamo Bay detention camp. He studied Iraq prisons last year and called for military police guards to help "set the conditions" for interrogations. Some interrogation methods used at Abu Ghraib appear to have been imported from Guantanamo. Miller now oversees U.S. prisons in Iraq. Karpinski was suspended last month from command of the 800th Military Police Brigade after she and other officers were faulted by Army investigators for paying too little attention to the prison's day-to-day operations and not acting strongly enough to discipline soldiers for violating standard procedures. In November, operating authority over Abu Ghraib was transferred to a military intelligence unit. In her defense, Karpinski has said that interrogations at the prison were not under her command but were run by a military intelligence unit that was "under increasing pressure to get more, as they call it, actionable intelligence." Karpinski said that during a visit to Iraq in September, Miller — still the commander at the Guantanamo Bay prison — spoke of wanting to "Gitmoize" Abu Ghraib by applying the Cuban facility's regimented detention and interrogation techniques. "He talked about Gitmoizing in terms of what the (military police) were going to do; he was going to select the MPs, they were going to receive special training," she said. "That training was going to come from the military intelligence command," Karpinski added, noting that the troops under her command had no training in such interrogation techniques. Miller and former Iraq commander Lt. Gen. Ricardo Sanchez have said their orders allowed military police to offer information to help interrogators, but they were forbidden to take active roles, such as denying sleep. Stefanowicz, whose own veracity has been questioned in the official prison investigation, told Army investigators in a sworn statement that Col. Thomas Pappas, the military intelligence chief at Abu Ghraib, personally approved of the sleep deprivation tactics. Previous reports indicate Sanchez gave the prison commander authority to use such tactics in September, before requiring in October that he sign off on any aggressive techniques. According to Stefanowicz, interrogation plans specifically placed one detainee on a "sleep/meal management program" that involved letting the prisoner sleep only in small blocks of time totaling no more than four hours out of every 24, up to a total of three days. The prisoner then would be allowed 12 hours of sleep, Stefanowicz told investigators. Stefanowicz's statement conflicts with congressional testimony by some top generals and statements by Stefanowicz' employer, CACI International Inc., that private contractors and military intelligence operatives never gave guards orders to take actions that would assist interrogations. Maj. Gen. Antonio Taguba, who oversaw the investigation that documented the abuses at Abu Ghraib, had access to Stefanowicz's statement before writing his report. Taguba agreed with the assertion that military intelligence officials directed the prison guards on activities but disputed Stefanowicz on the issue of whether he saw, engaged in or encouraged abuses. "He clearly knew his instructions equated to physical abuse," Taguba said of Stefanowicz. Stefanowicz's lawyer, Henry Hockeimer Jr., said Monday that his client is innocent of wrongdoing and he has gotten no indication his client will face criminal charges. Six enlisted military police soldiers are facing charges for abusing prisoners at Abu Ghraib. Another has pleaded guilty. Photos from the prison show prisoners being beaten, stripped naked, sexually humiliated and intimidated by dogs. According to The Washington Post, the Army has launched a criminal investigation of charges that a U.S. soldier was beaten last year when pretending to be a detainee in a training exercise at Guantanamo Bay. In a related development, Defense Secretary Donald H. Rumsfeld's panel investigating prisoner abuse interviewed the Pentagon's top civilian intelligence official Monday and more than a half dozen other senior defense officials and active duty personnel in Iraq. The panel didn't identify the individuals it interviewed Monday. But an official familiar with the investigation said members met with Miller, Pappas, the Pentagon's intelligence chief Stephen Cambone, and Maj. Gen. Donald Ryder, the Army's provost marshal general.